Caught on CCTV: A motorcycle rider was traveling in a full speed when he suddenly slams into the traffic sign in the middle of the road. According to the citizens who helped the rider, he was drunk and smells like sapodilla or in tagalog, chico. A screenshot from the CCTV video. 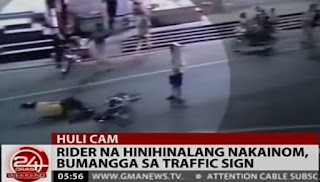 A news report from GMA News and Public Affairs shows the actual footage of the incident. The accident happened in Iriga City, Camarines Sur. After hitting the signage, the citizen fixed the traffic sign first before helping the victim. Two motorcycles collide in the middle of an intersection, thank God that both of them are safe.